How do I maintain dental hygiene at home? Brush with a fluoride toothpaste at least two times a day. Contact us to make appointments for your recommended hygiene and recall exams. How do I brush well? Hold your toothbrush to place the bristles at a 45 degree angle at the gum line. Store your toothbrush in an upright position, allowing it to air dry. Replace your toothbrush every three to four months (sooner if the bristles are irregular or frayed). How do I floss well? You can ensure that you are flossing effectively by following these flossing steps provided by Colgate. Choose either the cheaper but more fragile nylon (multifilament) floss or the more expensive but durable PTFE (monofilament) floss. Use approximately 18 inches of floss, winding the ends around each of your middle fingers. Hold the floss tight and slide it carefully in between your teeth. Curve the floss around the base of every tooth to make sure you are going beneath the gum line. Do not force the floss; otherwise, you will risk damaging your gum. Use a clean section of floss for every tooth. What type of toothbrush should I purchase? The best type of toothbrush is one that is the right size to provide you easy access to cleaning all your teeth with a long enough handle for your comfort. Bristle options include soft, medium, or hard nylon. The soft bristles with rounded tips are the safest, most comfortable option to protect your gums, root surface, and tooth enamel. For more information, check out WebMD for a list of the pros and cons of disposable and electric toothbrushes. If still unsure what type of toothbrush to purchase, ask your dentist at your next appointment. 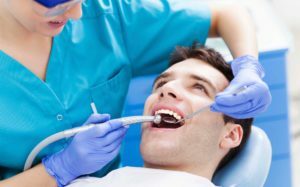 How often one should go to the dentist varies from one person to another, depending on individual dental health. Contact us to discuss the best plan for your oral health.